Besides credits on popular Netflix series such as Bloodline and Maniac, Lew has provided work on music videos for a number of superstars such as David Bowie, Madonna, Beyonce, Phoenix, and Miley Cyrus. A screenshot from the now removed “Current” section of the website. The CV and “Current” pages that showed the information was uploaded on April 13, 2018. Thanks to r/FrankOcean users u/ProbablyNotJoel and u/maoten93 for the tips. UPDATE: Darren Lew has removed all information regarding the video from his website. We’ve received word that a fan impersonating a member of Frank’s management asked him to take it down. Lew promptly complied to this request, removing the information at 5:30pm PST. It was also discovered that the abandoned boat (Pearl Faith) in the thumbnail is located in Plumb Beach, Brooklyn. Some arial footage of the vessel can be found here with more photos below. It appears that a majority of the images found online were shot between January and April. We compared the rate of erosion and displacement of sand around the boat with weather records during its stay on the beach. Considering these factors, the still was taken somewhere between March 9 and April 11. The most likely dates by snowfall were the 13th, 21st, and 30th. Looking at Darren Lew’s travel history, he was in Mexico on the 13th until at least the 15th. He can be, however, placed in Brooklyn on the 31st. Taken by Wagner_AZ on March 9, 2018. Published by Ry B on YouTube on Mar 12, 2018. 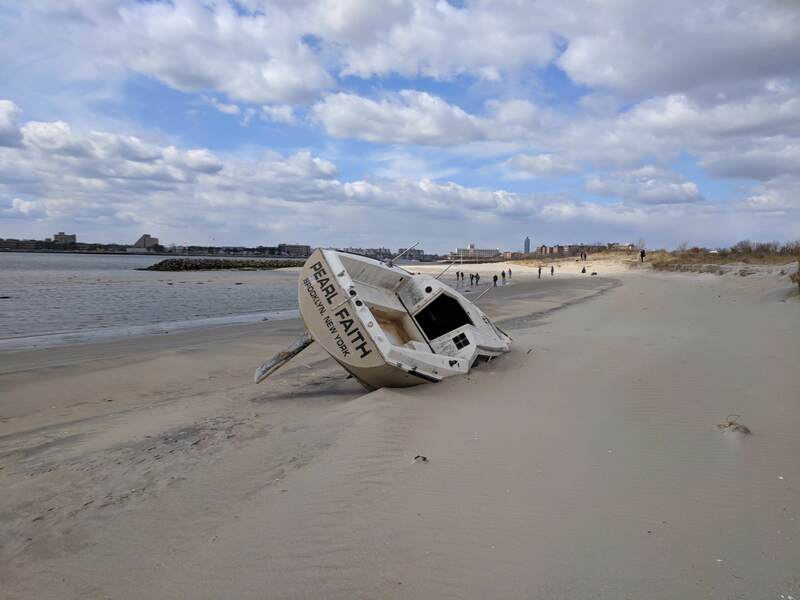 Overturned boat washed ashore by strong storm on Plumb Beach, Brooklyn, NY. Taken by Malgosia S. on March 4, 2018. Taken by Deborah Alves on March 16, 2018. Taken by Evan Allen on March 23, 2018.